What are the benefits of renewing your UpdraftPlus Premium license in 2019? Check out all the reasons why! Premium support: There’s our team available 18 hours a day to help you personally with any technical problems. New features and other improvements: A current licence allows you to update to new versions, gaining new features and staying compatible with future releases of WordPress. Some of the improvement we’ve added in 2018 include 27 new features, 37 fixes and 145 tweaks to make UpdraftPlus run smoother, easier, faster and more flexible. Plus in the next new days we’re adding a beta version of our most important ever new features: incremental backups. This will mean when you backup, only changes to files and images will be backed up. This will make backups of all sites much faster and less impact on the server performance. We are confident that UpdraftPlus Premium is the best WordPress backup plugin available and look forward to the new year to make UpdraftPlus even better for our loyal customers! If you’ve enjoyed UpdraftPlus in the past year, please help our team us improve further by leaving a 5* review on WordPress.org here. The post What are the benefits of renewing your UpdraftPlus Premium license in 2019? Check out all the reasons why! appeared first on UpdraftPlus. UpdraftPlus – Backup, restore and migration plugin for WordPress. Yesterday we did a quiet beta launch of one of our most anticipated and major new features for UpdraftPlus premium – incremental backups. This revolutionary new capability means you can now backup the files that have changed on your website, rather than create a new backup from scratch every time. Please do try it out and let us know what you think. If you find any issues please report this to our usual support channels and we’ll work on making updates ASAP. We’ll be shouting about this launch more loudly in January as it comes out of beta. A huge thank you to all our users – you’ve given us reason to be jolly by helping us reach 2 million active installs this morning! We’re thrilled at reaching this milestone. 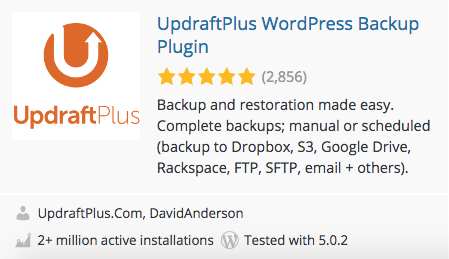 All across the globe, 2,000,000 WordPress sites are now trusting UpdraftPlus for backups. Perhaps we’re biased, but we can hardly blame them. We work hard to ensure that UpdraftPlus is not only far-reaching in its functionality, but also simple to use. All the time, we’re improving and developing it, to give you the best possible user experience; quality is everything. • In July 2015, UpdraftPlus reached half a million active installs and was rated #28 of the most-installed plugins. • Last January, it attained the million active-user milestone, with its rating increasing to #22. • Less than a year later, we have doubled our userbase, with our rating climbing up to #16. Exclude plugins not owned or promoted as feature plugins by Automattic, and we’re #11. • This all means you’ve made us the 6th most installed 5* rated plugin in the world. Obviously, we only have you to thank for this achievement. We’re extremely grateful to you for choosing UpdraftPlus. The post You’ve made our Christmas! UpdraftPlus passes 2 million active installs appeared first on UpdraftPlus. UpdraftPlus – Backup, restore and migration plugin for WordPress. We are pleased to announce an updated version of UpdraftPlus 1.16.0 with newly added features, fixes and tweaks. We recommend the update for all UpdraftPlus Free and Premium users. The post UpdraftPlus 1.16.0 released appeared first on UpdraftPlus. UpdraftPlus – Backup, restore and migration plugin for WordPress. UpdraftPlus preview upcoming revolutionary development for WordPress backups! By the end of the week, UpdraftPlus will be releasing a new and amazing development that we want to share with you. Due to viruses, hackers and errors, keeping an up to date backup of your website is one of the most important things anyone who has a WordPress site can do. For many years UpdraftPlus has helped backup sites all over the world to ensure that users are always protected. After months of development, we are thrilled to announce the upcoming release of a brand new additional backup feature; Incremental Backups. How is it different to regular backups? When using UpdraftPlus Incremental Backups, users will have the ability to schedule an incremental file backup to the hourly schedule of their choice. This means once UpdraftPlus has taken the initial full backup of your site files including images, media, video, databases, plugins, themes etc., it will subsequently only backup any new changes that have occured over the period of hours you have selected. This could range from something as small as a new blog you have added, to an entire website and theme overhaul. This is a massive new development that will help to reduce the huge resources used to perform full backups, which will also help users who have low resource servers. That’s not all! The new feature will even let you check when the last incremental backup was and give you the option for a partial or full site restore, taking all the work and worry out of backing up your site. Incremental Backups will be available with UpdraftPlus Premium by the end of the week. Visit UpdraftPlus for further updates and information. The post UpdraftPlus preview upcoming revolutionary development for WordPress backups! appeared first on UpdraftPlus. UpdraftPlus – Backup, restore and migration plugin for WordPress.